Welcome to edition 439 of Insider Weekends. 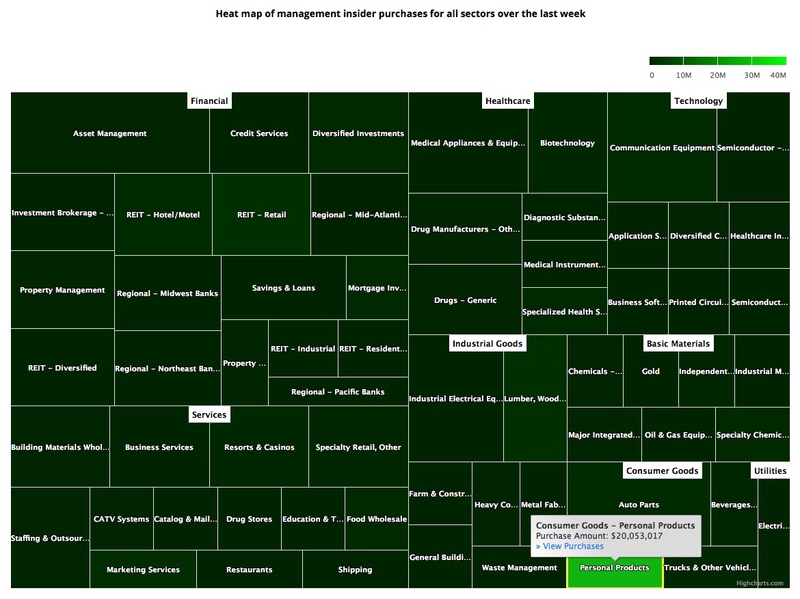 Insider buying increased last week with insiders purchasing $178.94 million of stock compared to $106.85 million in the week prior. Selling also increased with insiders selling $1.18 billion of stock last week compared to $1.09 billion in the week prior. Sell/Buy Ratio: The insider Sell/Buy ratio is calculated by dividing the total insider sales in a given week by total insider purchases that week. The adjusted ratio for last week dropped to 6.58. In other words, insiders sold almost 7 times as much stock as they purchased. The Sell/Buy ratio this week compares favorably with the prior week, when the ratio stood at 10.23. CEO Kelcy L. Warren acquired 2,000,000 shares, paying $15.55 per share for a total amount of $31.09 million. Mr. Warren increased his stake by 5.33% to 39,542,084 shares with this purchase. Director Ray C. Davis acquired 316,000 shares, paying $15.80 per share for a total amount of $4.99 million. Mr. Davis increased his stake by 1.18% to 27,052,558 shares with this purchase. You can view the list of recent insider transactions for Energy Transfer LP here. Director B. Wayne Hughes acquired 664,843 shares, paying $20.27 per share for a total amount of $13.48 million. Director Tamara Hughes Gustavson acquired 664,842 shares, paying $20.27 per share for a total amount of $13.48 million. Mr. Gustavson increased his stake by 3.96% to 17,459,840 shares with this purchase. These shares were purchased indirectly through a trust. With their latest set of purchases, the Hughes have acquired nearly $67 million worth of stock in November and have increased their stake in the company to over 11% of shares outstanding. Chief Executive Officer Pierre Laubies acquired 2,308,447 shares, paying $8.69 per share for a total amount of $20.05 million. Mr. Laubies increased his stake by inf% to 2,308,447 shares with this purchase. Director Robert S. Singer acquired 45,000 shares, paying $8.30 per share for a total amount of $373,288. Mr. Singer increased his stake by 25.00% to 225,000 shares with this purchase. Chief Executive Officer Scott L. Bok acquired 220,634 shares, paying $22.60 per share for a total amount of $4.99 million. These shares were purchased indirectly by Bok Family Partners L.P.
Director Robert F. Greenhill acquired 219,770 shares, paying $22.69 per share for a total amount of $4.99 million. These shares were purchased indirectly by Socatean Partners. You can view the list of recent insider transactions for Greenhill & Co., Inc. here. Chief Executive Officer David Weinreb acquired 50,000 shares, paying $109.39 per share for a total amount of $5.47 million. Mr. Weinreb increased his stake by 3.92% to 1,325,177 shares with this purchase. President Grant Herlitz acquired 4,570 shares, paying $109.39 per share for a total amount of $499,912. These shares were purchased indirectly by Moss Creek Capital, LP . Director Allen J. Model acquired 1,000 shares, paying $108.98 per share for a total amount of $108,980. Mr. Model increased his stake by 6.23% to 17,062 shares with this purchase. You can view the list of recent insider transactions for The Howard Hughes Corporation here. Director Evan Clark Williams sold 682,242 shares for $33.18, generating $22.64 million from the sale. These shares were sold indirectly by various trusts. CFO Ned D. Segal sold 6,000 shares for $32.16, generating $192,959 from the sale. 295 of these shares were sold as a result of exercising options immediately prior to the sale. Chairman Charles R. Schwab sold 383,000 shares of this investment brokerage for $46.97, generating $17.99 million from the sale. These shares were sold indirectly through a trust. You can view the list of recent insider transactions for The Charles Schwab Corporation here. Chief Operating Officer Sheryl Sandberg sold 55,000 shares for $143.34, generating $7.88 million from the sale. 31,686 of these shares were sold indirectly by various trusts. Chief Technology Officer Michael Todd Schroepfer sold 38,164 shares for $142.92, generating $5.45 million from the sale. These shares were sold indirectly by various trusts. Chief Financial Officer David M. Wehner sold 10,000 shares for $209.90, generating $2.09 million from the sale. Chief Executive Officer Anders Gustafsson sold 35,160 shares for $182.73, generating $6.42 million from the sale. These shares were sold as a result of exercising options immediately prior to the sale. Director Andrew K. Ludwick sold 34,000 shares for $178.04, generating $6.05 million from the sale. SVP, Global Sales Joachim Heel sold 2,480 shares for $182.38, generating $452,300 from the sale. SVP, Corporate Development Michael Cho sold 1,393 shares for $182.95, generating $254,849 from the sale. You can view the list of recent insider transactions for Zebra Technologies Corporation here. President and CEO John F. Thero sold 607,611 shares of this biotech company for $19.07, generating $11.59 million from the sale. 407,611 of these shares were sold as a result of exercising options immediately prior to the sale. You can view the list of recent insider transactions for Amarin Corporation plc here.